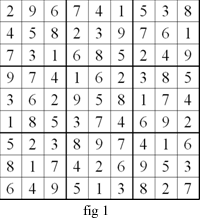 This Sudoku consists of a pair of linked standard Sudoku puzzles each with some starting digits. 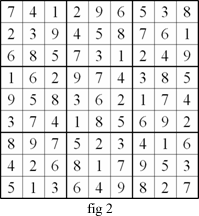 As usual, the object of this Sudoku is to fill in the whole of each 9x9 grid with digits 1 through 9 so that each row, each column and each block contain all the digits 1 through 9. Given that twin A is the original puzzle, twin B is obtained by swapping a horizontal/vertical chute or band of blocks with another horizontal/vertical chute or band of blocks. 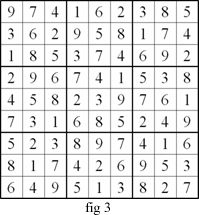 By such transformation, twin A and twin B are essentially the same or equivalent Sudoku puzzle. For example, fig 2 is created from fig 1 by shifting the first chute of 3 blocks sideways to the right and the second chute of 3 blocks sideways to the left. Similarly an equivalent puzzle (fig 3) can be created from fig 1 by shifting the first chute of 3 blocks downwards and the second chute of 3 blocks upwards. The three puzzles are equivalent to one another. Equivalent puzzles can also be created from fig 2 and fig 3 by similar transformations. Logo. Networks/Graph Theory. Games. Combinatorics. Mathematical reasoning & proof. Working systematically. Generalising. Creating and manipulating expressions and formulae. Chemistry. Visualising.